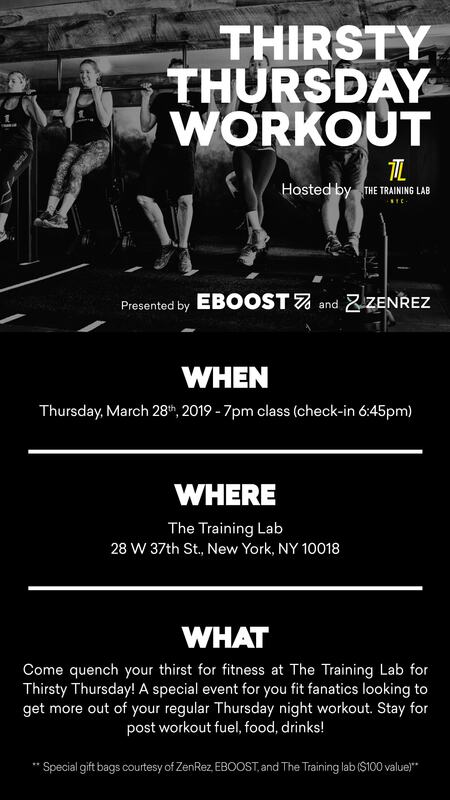 EBOOST, ZENREZ, and The Training Lab have teamed up to bring you the ultimate Thirsty Thursday! This Thursday join us at The Training Lab for a fun event packed with everything you want out of a thirsty, yet healthy and fit, Thursday night! At The Training Lab aka The Lab, they are dedicated to training hard and training smart. The Lab focuses on mechanics, consistency, and intensity. Fitness in their perspective is the ability to perform a task. Whether that’s to run a half marathon, complete a triathlon, simply lose weight or just be a better version of yourself. The Lab’s program we will give you a foundation that enables you to reach all your goals. You are what you repeatedly do. You are not what you do occasionally. The Lab challenges you to be consistent. This Thursday at 7pm we will start off the evening first with a sweat session followed by a post-class party with food & cocktails! 1 SUPER FUEL energy can- ginger lime fl. 1 SUPER FUEL energy can- strawberry lemonade fl. 1 SUPER FUEL energy can- orange mango fl. ZENREZ class credits. ZENREZ class credits applicable to The Training Lab, Box + Flow, Yoga Vida, F45, and more! For tickets, you can snag them here. They are only $35. The event lasts until about 9:30 pm. Please reach out with any questions.